Steely Eyed Killers of the Deep- Meet the Crew! Here they are ladies and gentlemen. 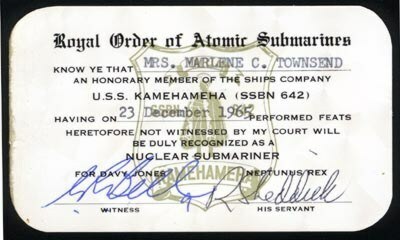 Here are the steely eyed killers of the deep and cold warriors of legend who made the Kamehameha the the fearsome fighting vessel that she was. 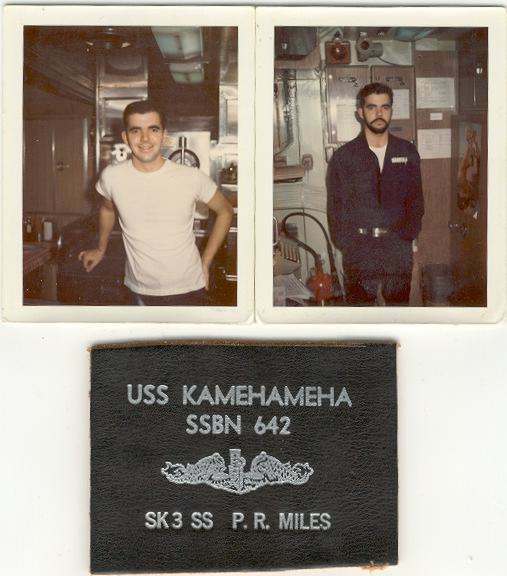 This page contains photos of crew members the USS Kamehameha that various people have sent me. 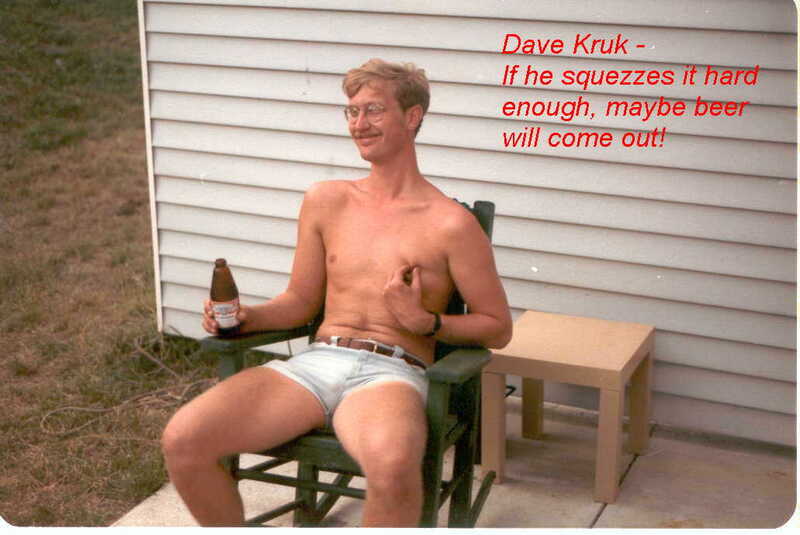 If for some reason your picture appears here without permission and you would like it removed, please let me know. Photo donations are welcome. Send your photos to me and I will post them here. 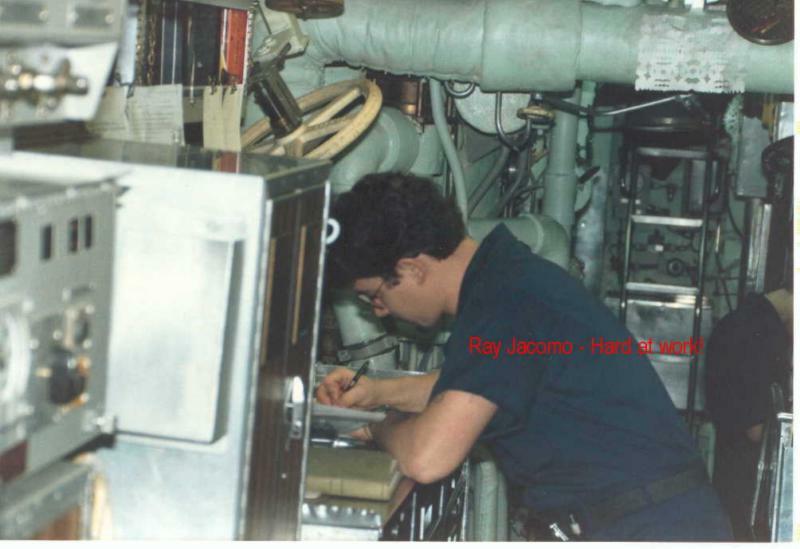 The first 15 photos in this series were donated by Ray "J" Jacomo. Thanks Ray. 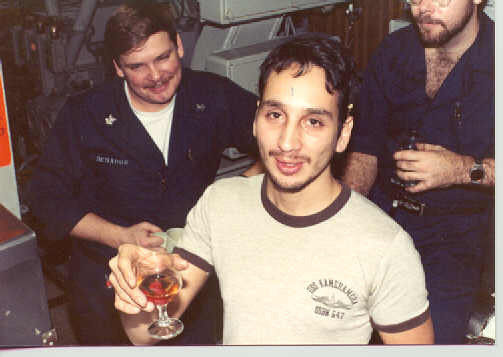 Yours truly, the webmaster, Greg Pancerev, getting my first Good Conduct Medal in the crew's mess, 1984. Dennis Rihm is standing behind me. 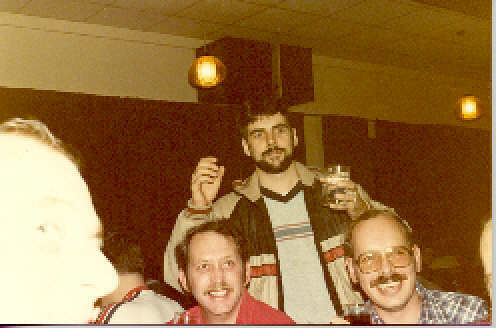 Gordon McDonald, Busby, Bill Larusch, Gary Johnston, Mike Carter, and a few others on half-way night 1984 or 1985? 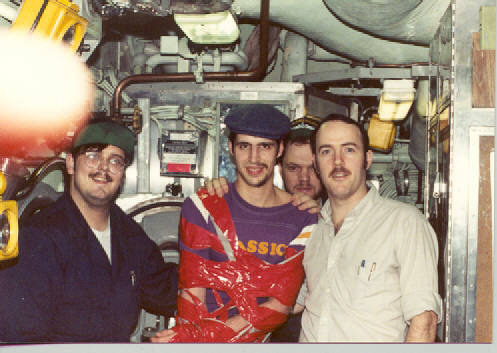 Rex Merrick giving a pie to an unidentified victim Joel Johnson, Alan D. Powers, and Shawn Lockwood with an unidentified victim taped with EB Red, the submariners version of duct tape. Are they in AMR1? 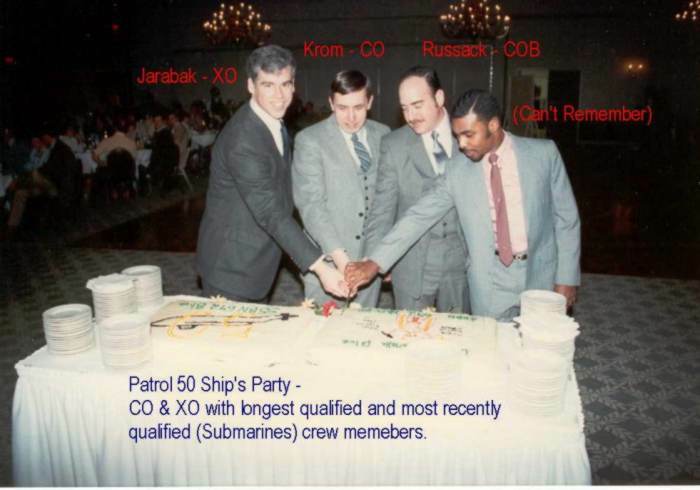 The XO, CO, and the COB (Barry Russack) at the ship's party, Sub Base, Groton , CT 1984? 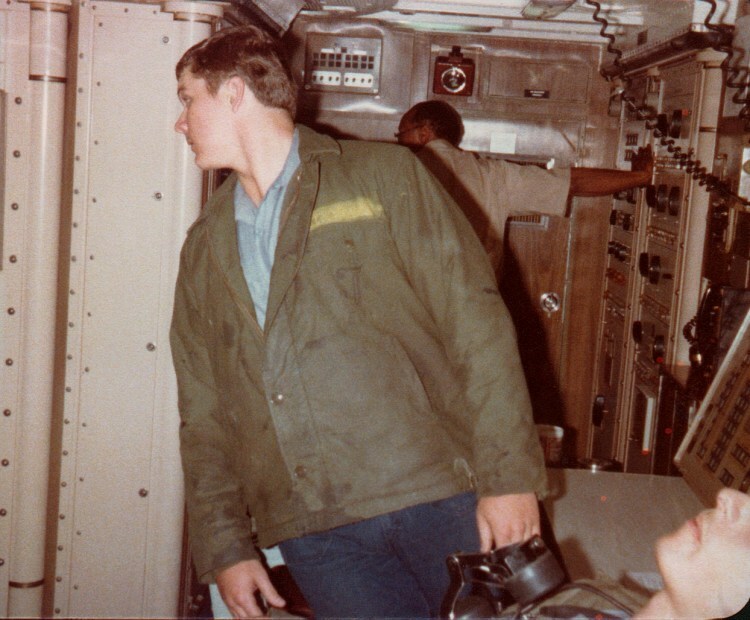 From Chuck Stephens: "This is a picture taken during my 6th patrol (April or May of '76). This is most of the MT gang standing around launcher with the exception of the guy in the lower right. That is Sam Niece, who was a TM. 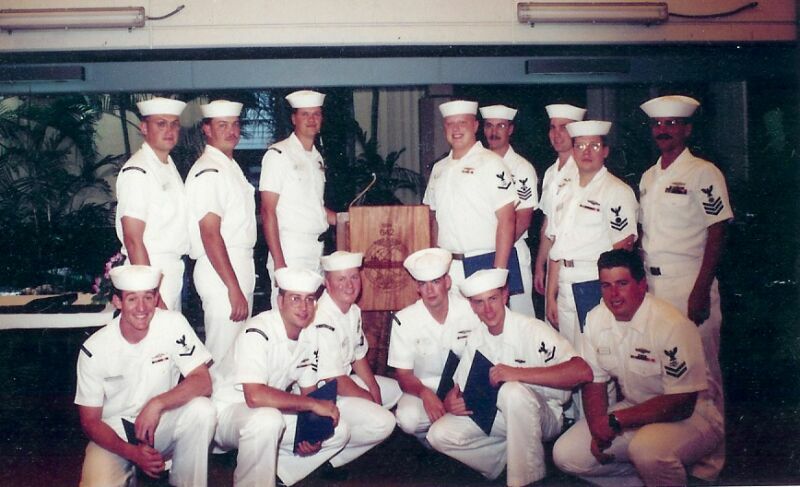 I am the one standing up with the whistle around my neck (that was in case I had to spread the alarm if intruders tried to overwhelm us and launch a missile). 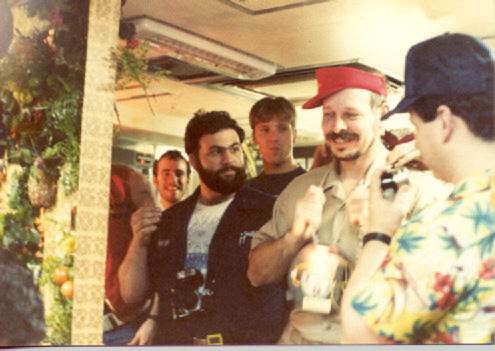 Bob Kasicki is the guy directly in front of me, Mike Lueken is the one sitting to my left. 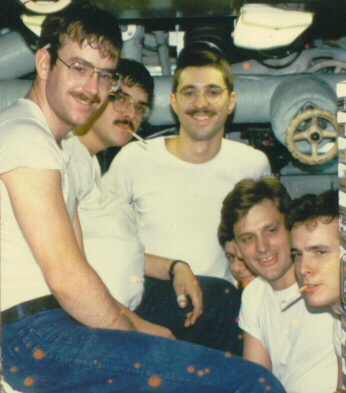 I don't remember the other three guys' names, but as I recall they were all non-qual fng's". 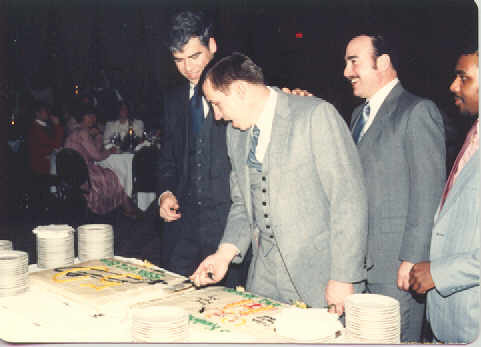 Update: Frank Bates says that the other three are: Mike Fry, Gerald "Gus" Gustavson and Fran Magee. Also, Sam Niece stood his watches at Launcher and converted to MT. 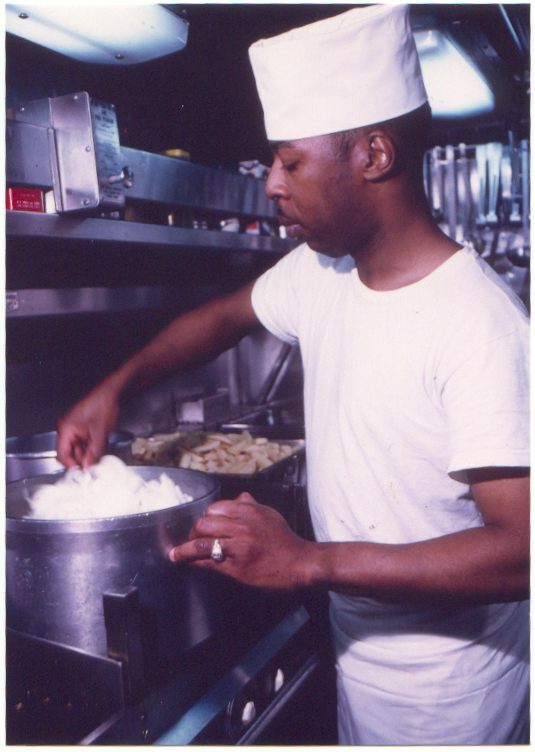 Pat Miles in the mid 1960's? 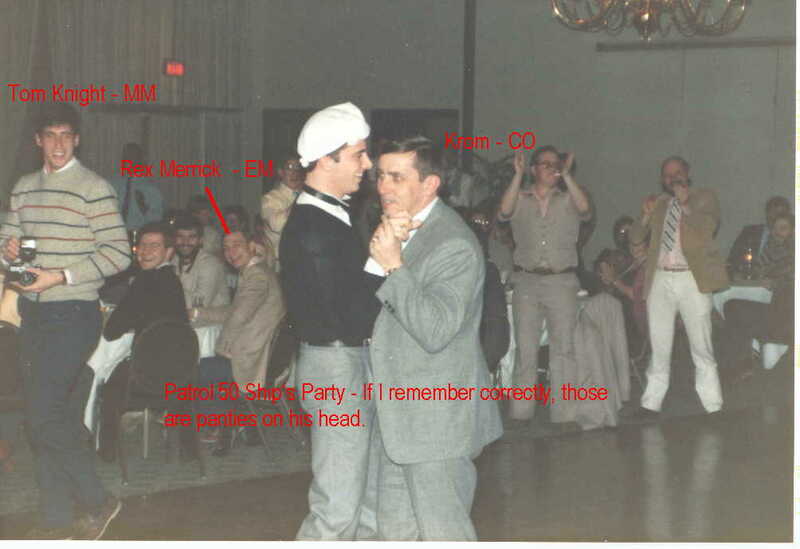 Pat Miles with Jim and Phil? Any last names here? 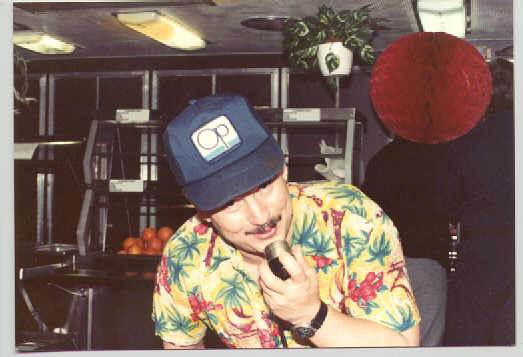 This is Howard Grover on Gold patrol 2. 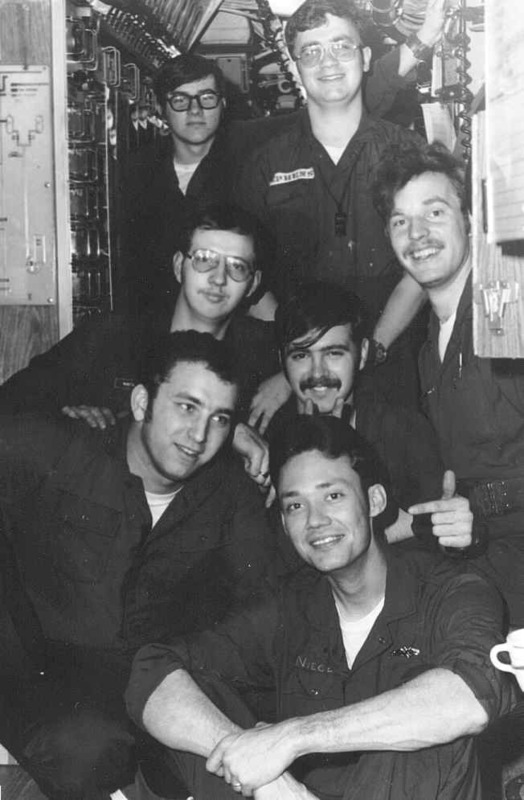 Photo dated 7-1-67. 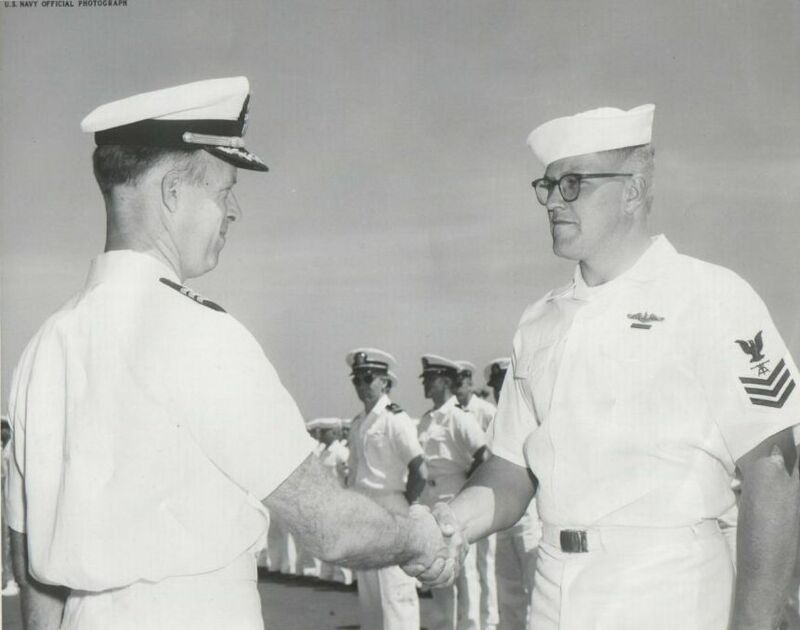 This is Howard Grover more than 30 years later at Pearl Harbor. Pretty cool huh? 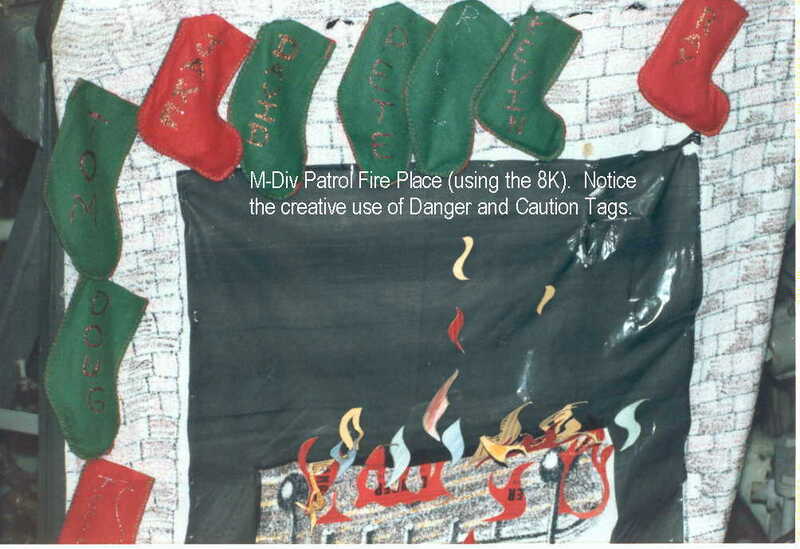 M-Div Patrol Fireplace (1983) Master Chief Meng - another classic photo. 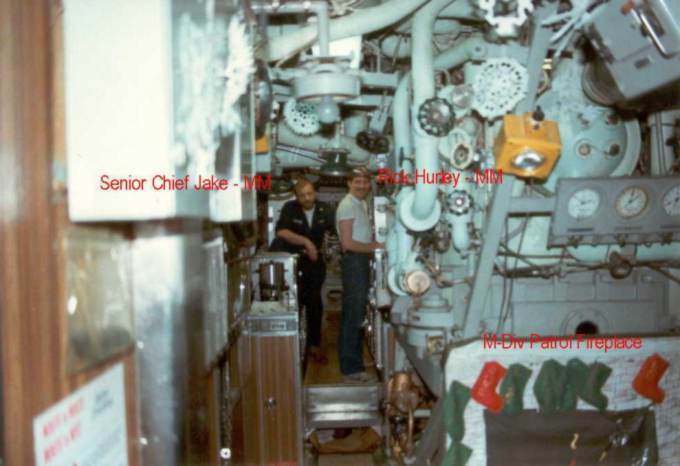 I stood the AMR2UL watch that patrol (50) and he smoked a cigar on that bench every midwatch. 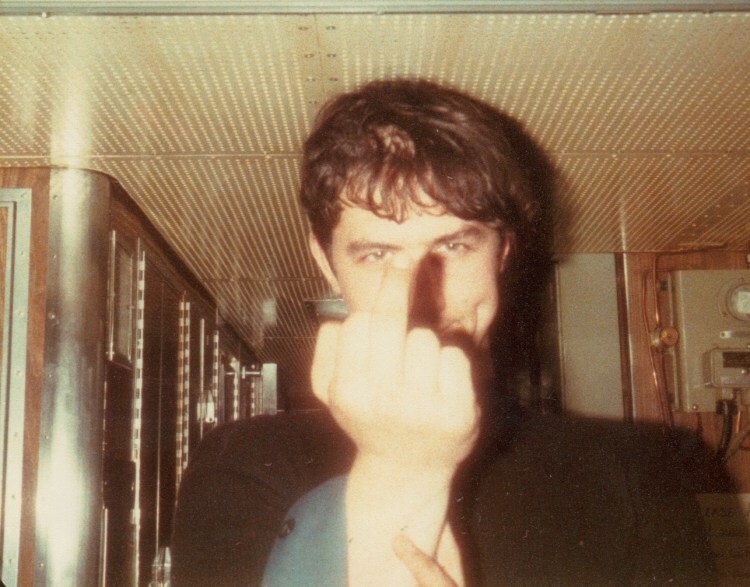 From Richard Sprowl: This is me in the MCC, 1979 near HAL 9000 From Richard Sprowl: "This is Ron Goodstein in the crew lounge giving his opinion of life underway, 1979. 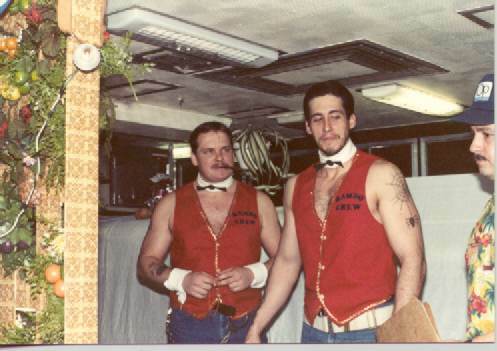 Ron was the life of the party, and anytime something was wrong, he was the first guy the XO called." 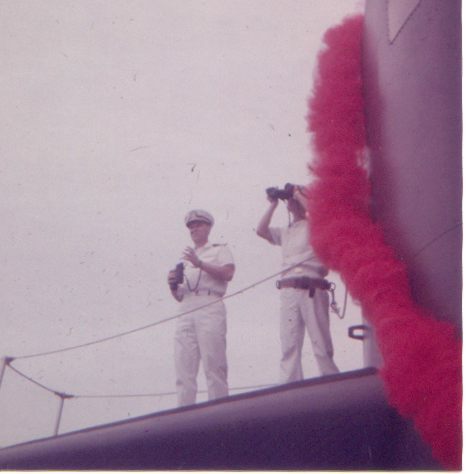 From Richard Sprowl: "This is during my second patrol. 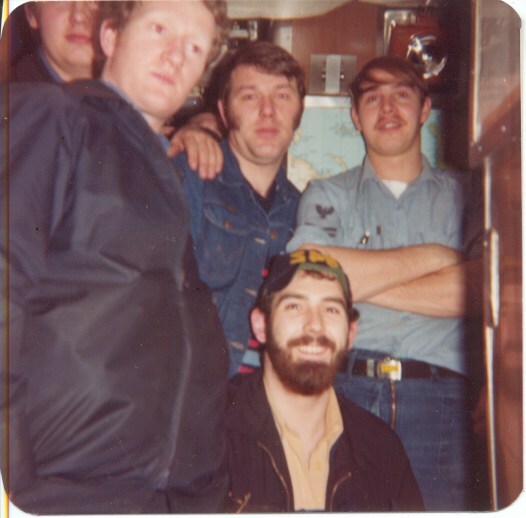 We caught the boat in Holy Loch in January, 1979. I found out what they mean by sideways snow. 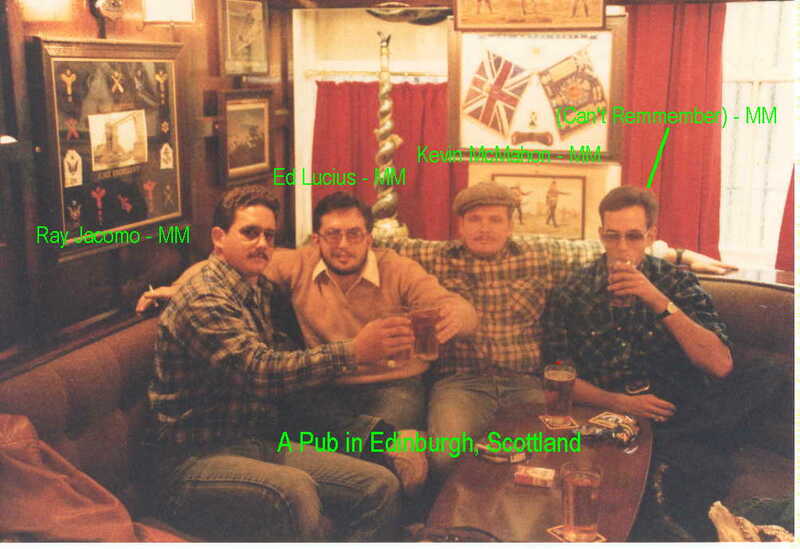 This is at Edinburgh Castle. 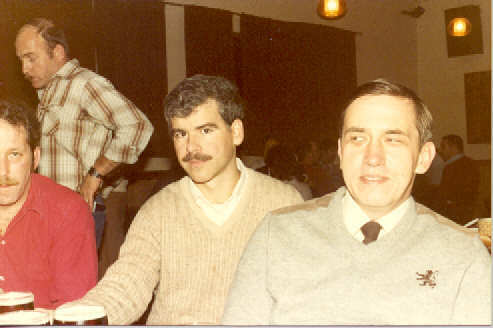 On the left is Karl Wald, I am on the right, and Mike Polley is taking the picture. 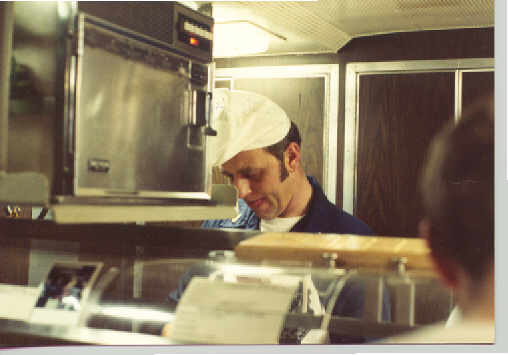 I am sure everybody remembers Dunoon with its fabulous night life, fish and chips on newspaper, and room temperature ale (cold)." 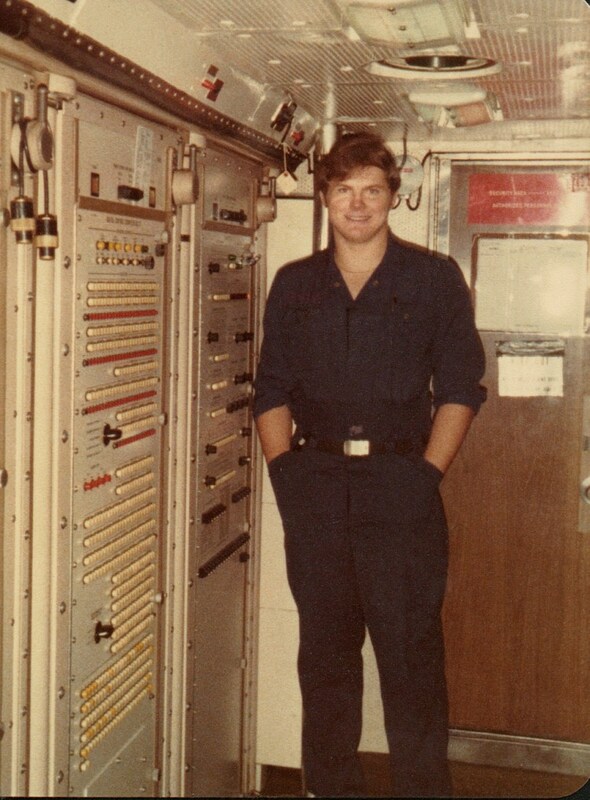 From Richard Sprowl: "This is also during my second patrol about February, 1979. 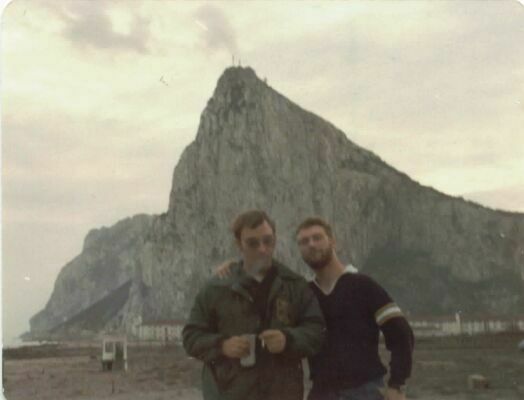 We had just completed a DASO where we shot 4 big firecrackers down the Atlantic Range. 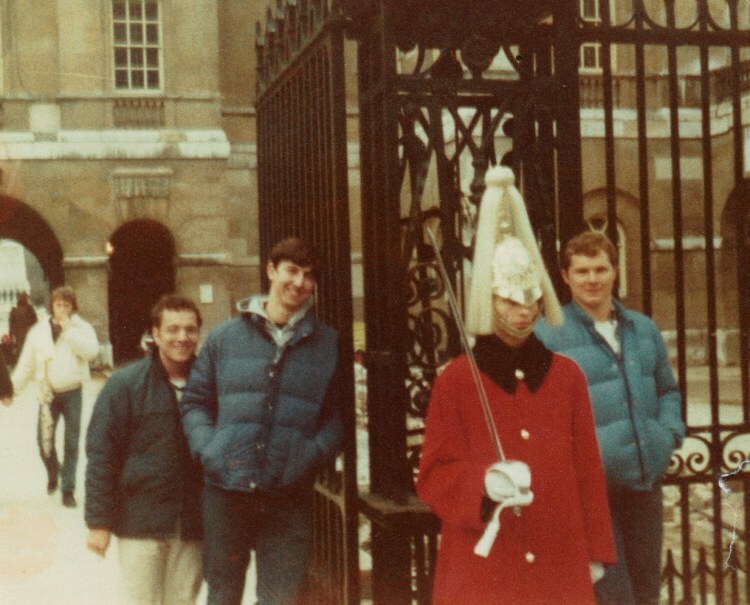 We then went to Portsmouth, England and then took a bus to London for the day. 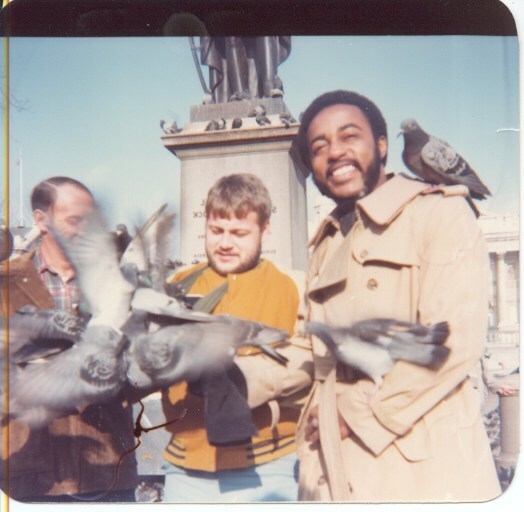 On the left is Brian (Motzy) Fuller, center is Ron Goodstein, and I am on the right". 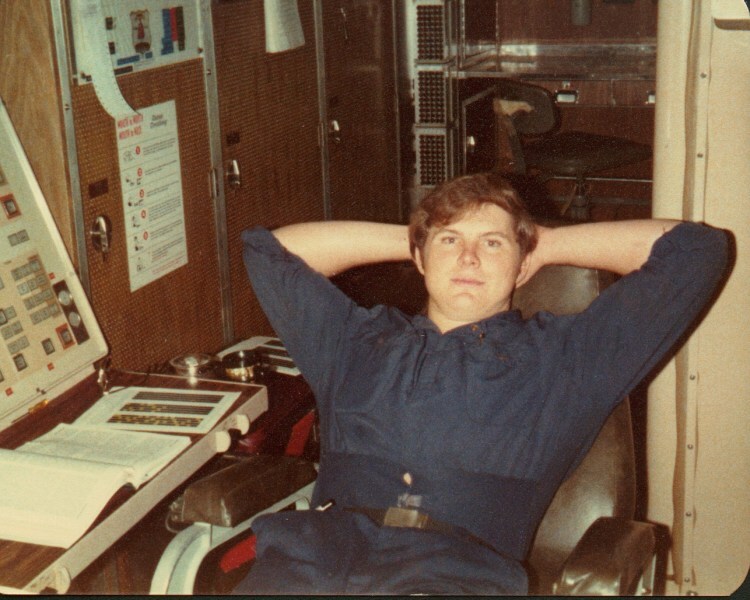 From Richard Sprowl: "This is me in the MCC, 1979. It looks like I am working hard on my 2nd class PO exam." 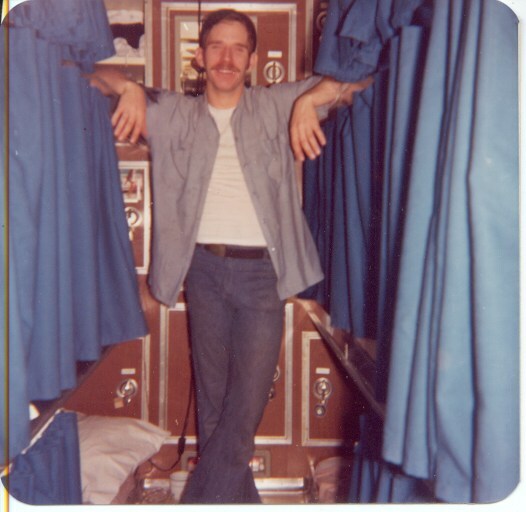 "Angles and Dangles in the MCC right after leaving Rota, Spain, July or August 1978. 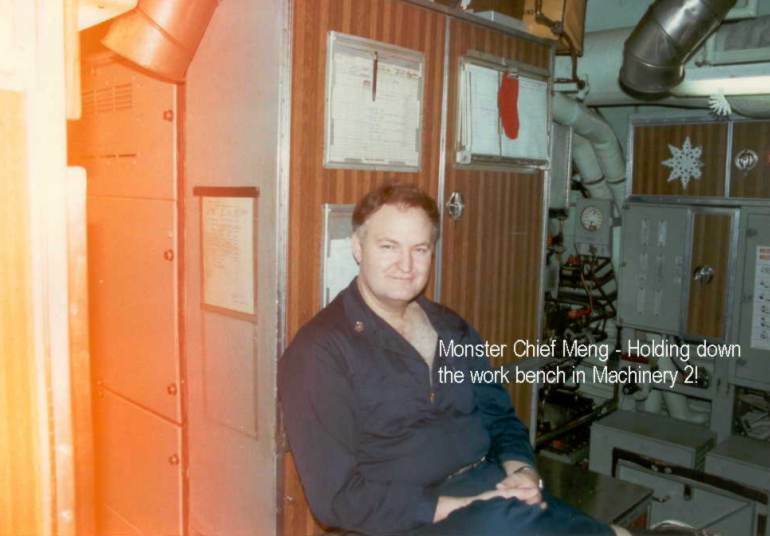 I am on the right, the guy behind me is FTBCS Wisdom holding onto the main MCC power panel, and I think the guy with the phones in the chair is FTB2 Kiszka. 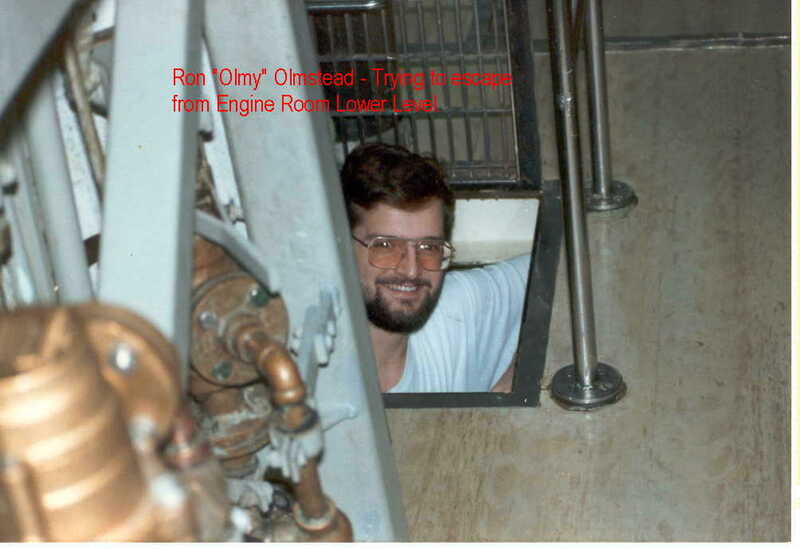 It looks like he is checking for leaks in the overhead or taking a nap." 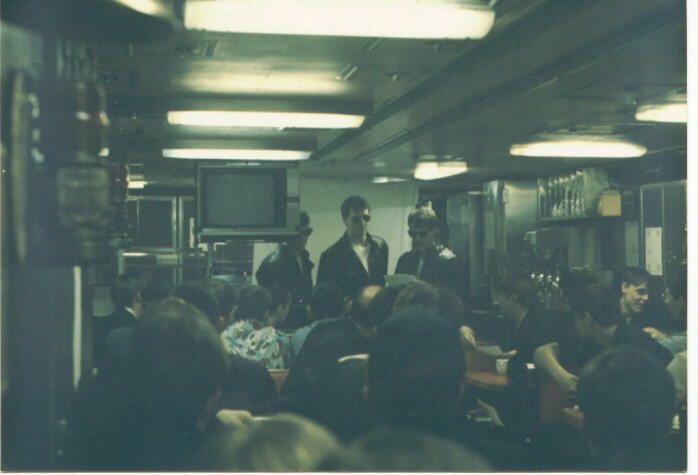 From Jack Townsend: "This is a picture of me, Jack Townsend ET1(SS) at that time, and my wife Marlene, on a Blue Crew dependents cruise early in 1966 (actually Dec 23, 1965 see below). 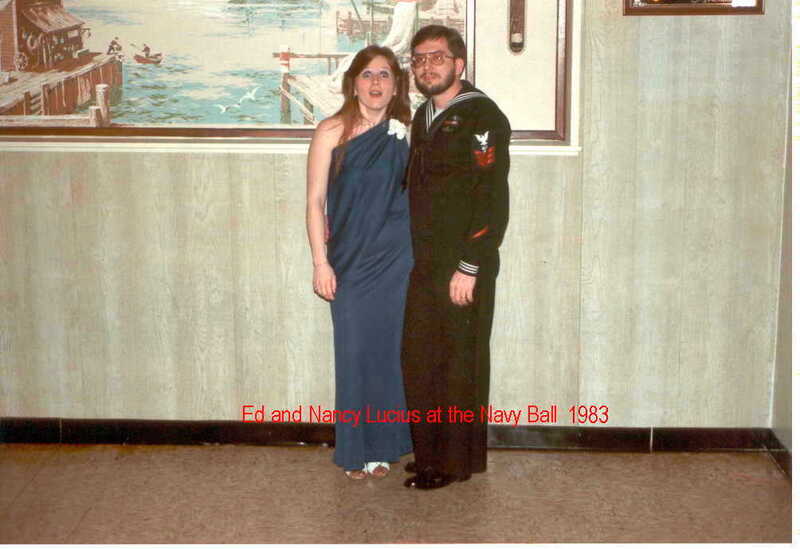 We were at sea (don't remember why) and pulled into San Francisco Bay to pick up the dependents. 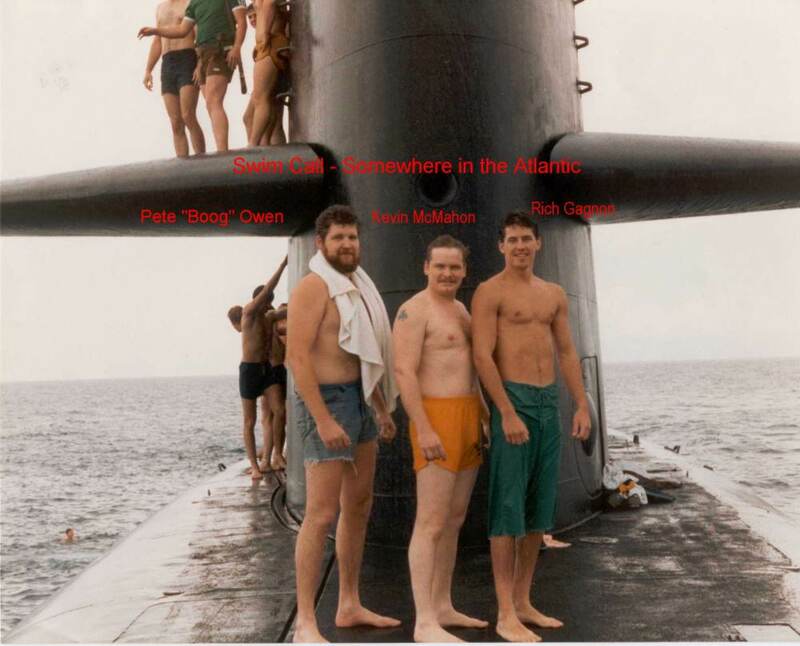 As any submariner who has ever been in that area of the ocean at that time of the year knows, its often a rough ride until you submerge and so there were more than a few "green eyed" dependents by the time we got into waters deep enough to dive." 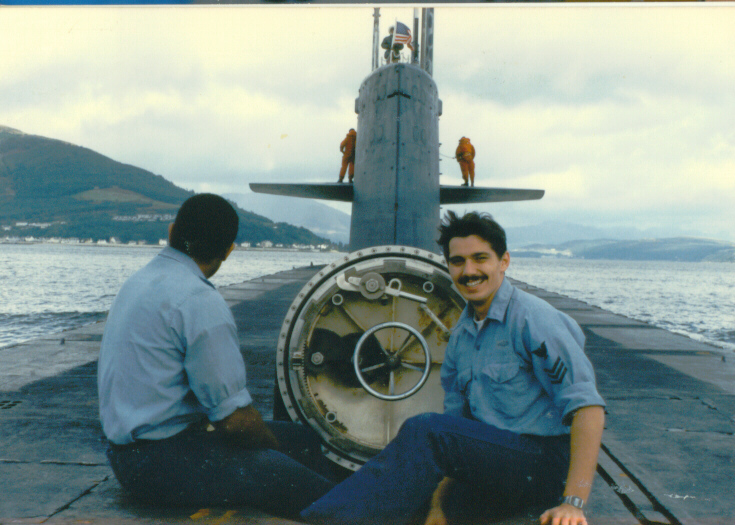 "In the picture, the boat has finally submerged, people are starting to feel a little better, and I took Marlene up to the control room so that she could look through the scope when someone snapped this picture. It's not a very good picture of either of us but its real! Marlene was pregnant with our second child at the time and almost wasn't allowed to come on the cruise because she was quite far along." 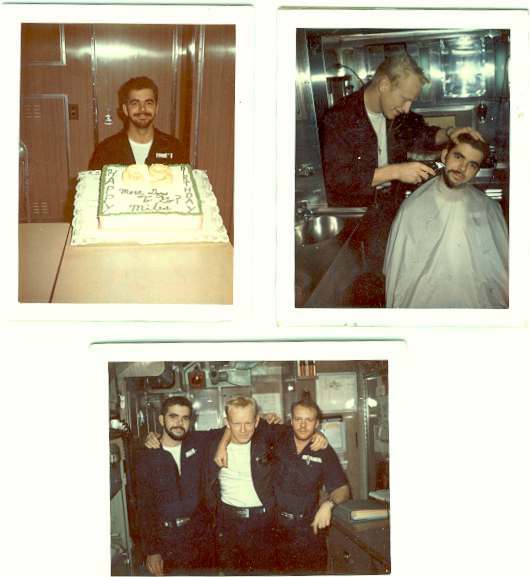 From Jack Townsend: "The little wallet card was given to my wife during the dependent' s cruise that I sent you a picture about earlier. 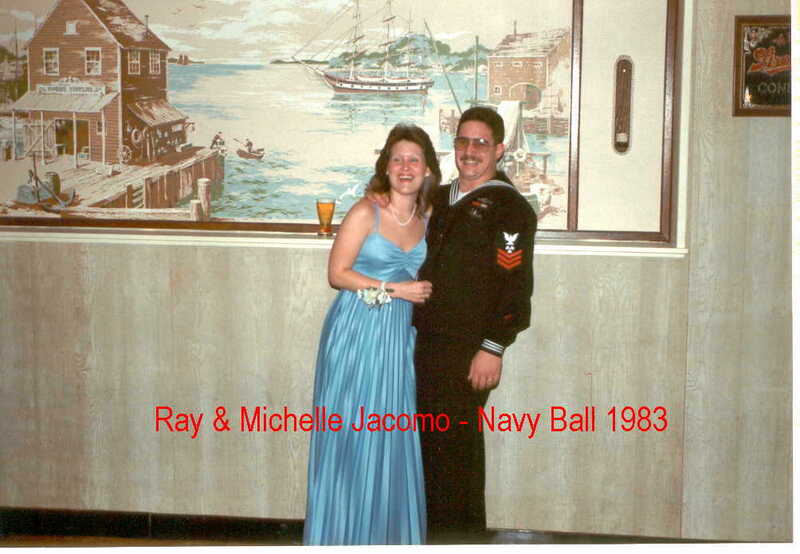 As you can see, the date is shown as 23 December 1965, so I was a little off when I said that the cruise was in early 1966." 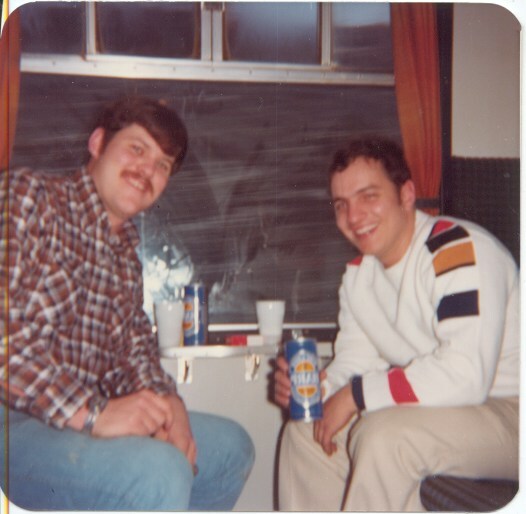 From the the 1970's. 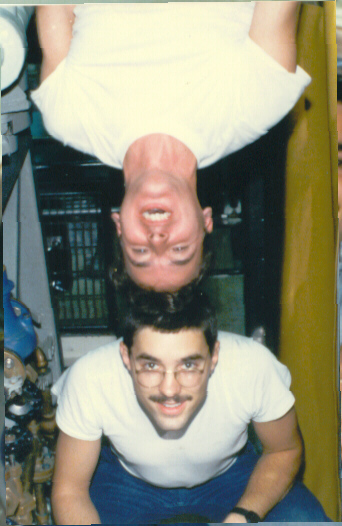 This and the next three photos were donated by Steve Chickering. 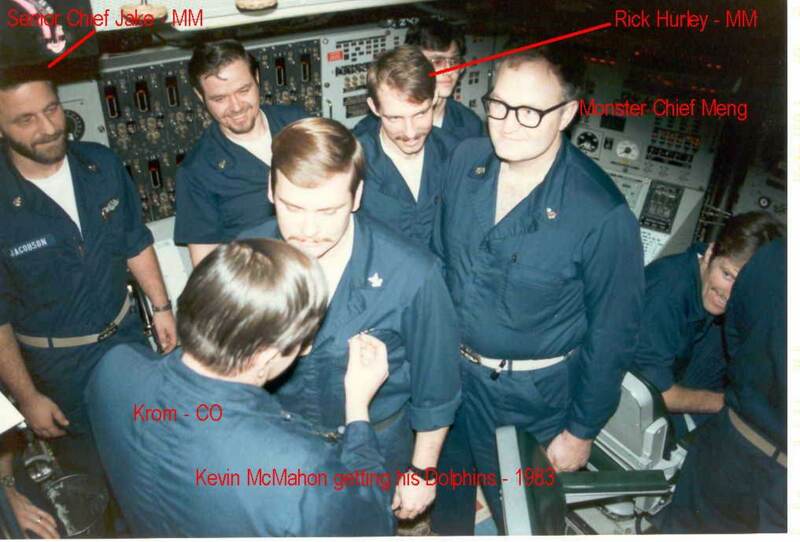 "This is RM2(SS) Richard Hirsch taken in crew's berthing." 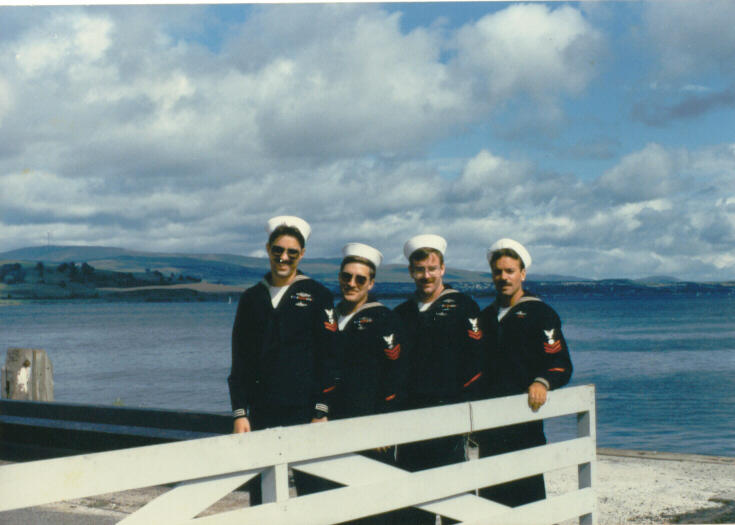 "This is in London (we pulled into port in Portland, UK and took a train to London), left to right TM1(SS) ?? 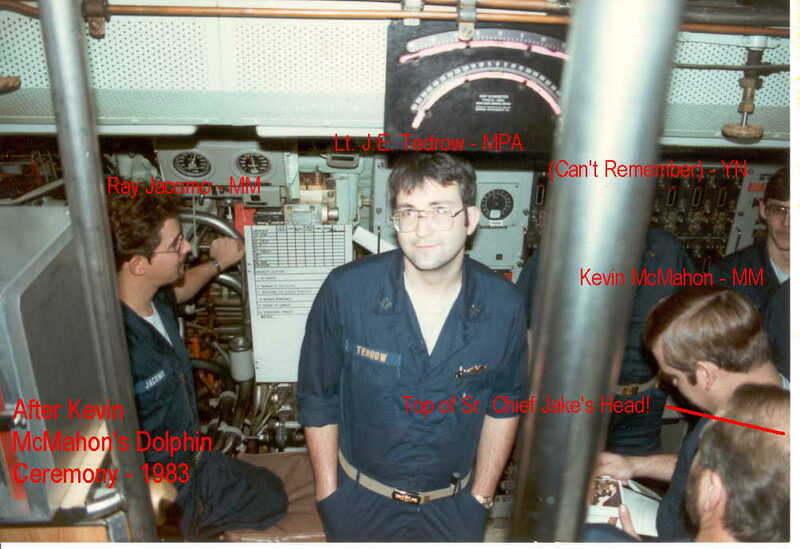 Not sure of the name---then is TMSA (SS) Tom Wells, last is RM2(SS) Ocie Greene." 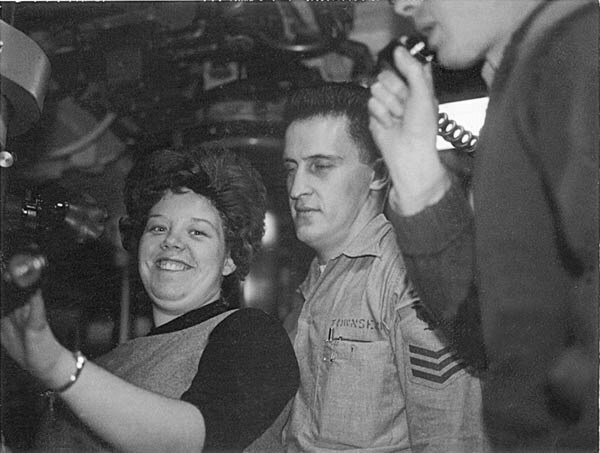 "These guys are from a diesel boat from UK, we went aboard and helped them drink their beer ration. Notice the guy in the middle had traded someone on the Kam for a hat." 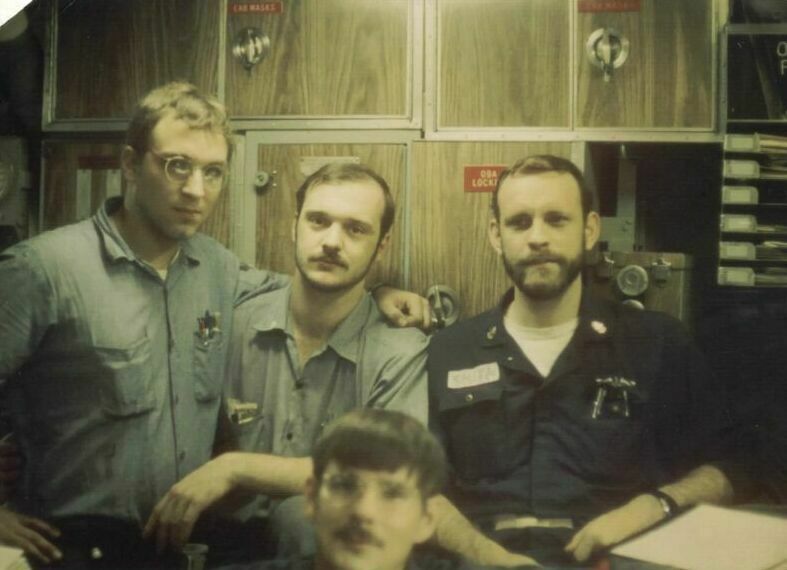 "This is on the train to London, left to right is RM2(SS) Steve Chickering and QM3(SS) Brian Fuller." 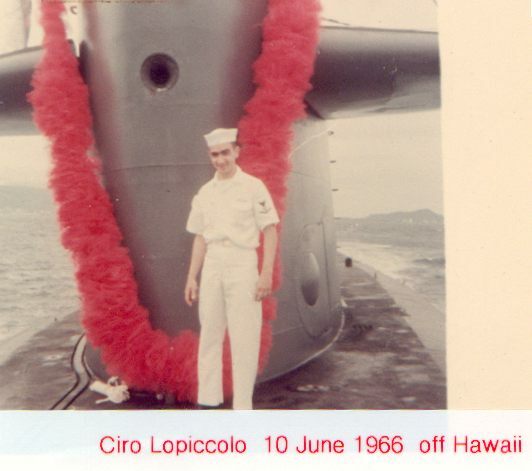 From Ciro "Loopie" Lopiccolo. This is Capt. Dickerson This is Ciro himself in 1966. 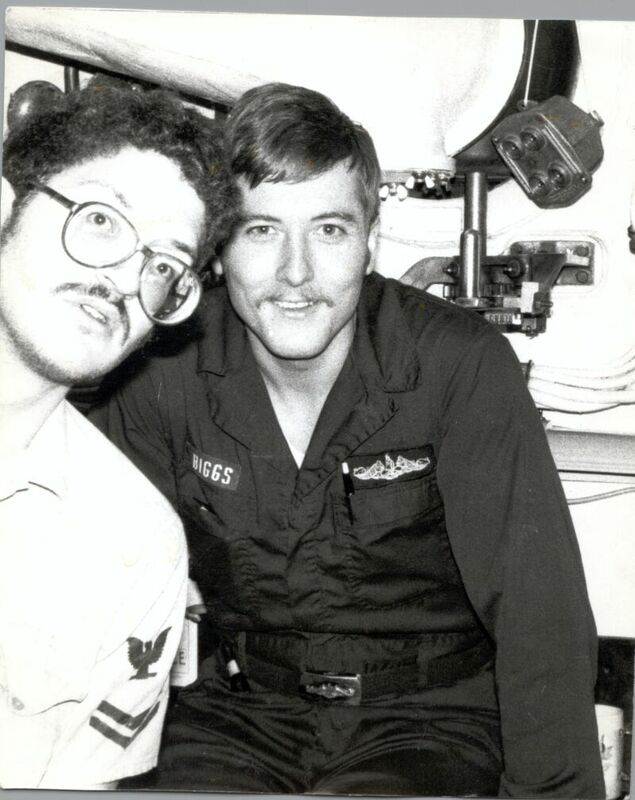 Can anyone identify this crew member? Also from 1966. 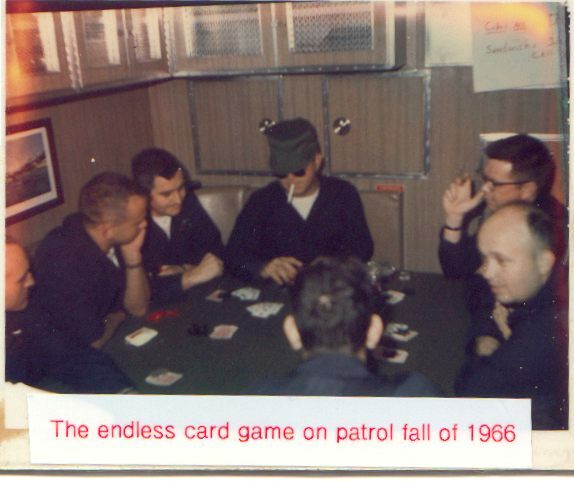 The endless card game in the crew's lounge. Photo from Ciro Lopiccolo. 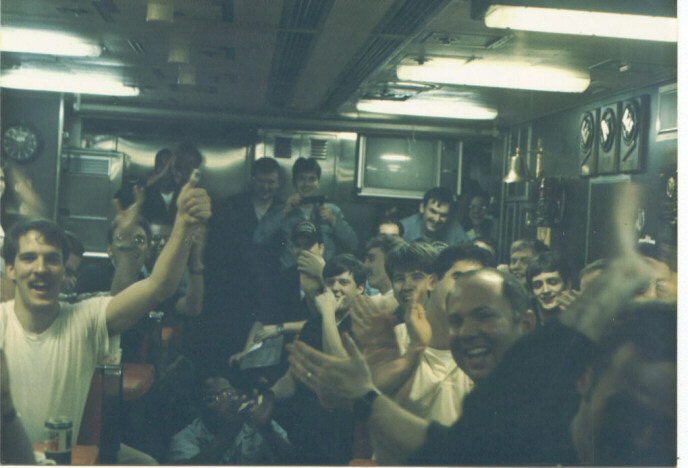 From Bill Jones - Patrol 59 (May 1986) half-way night festivities on the mess decks. The three singers are Lance Bachis, Steve Connell and myself. We won first place with our song "Bye Bye EFPH Goodbye" sung to American Pie. 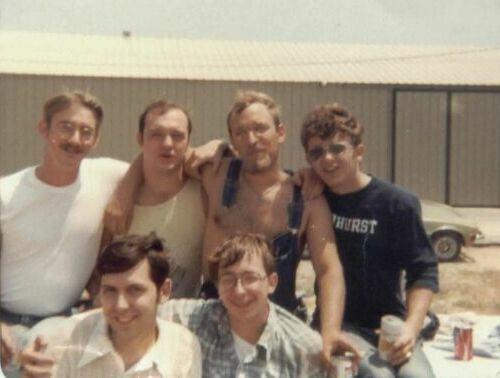 Bill Jones is the one in the t-shirt on the left. 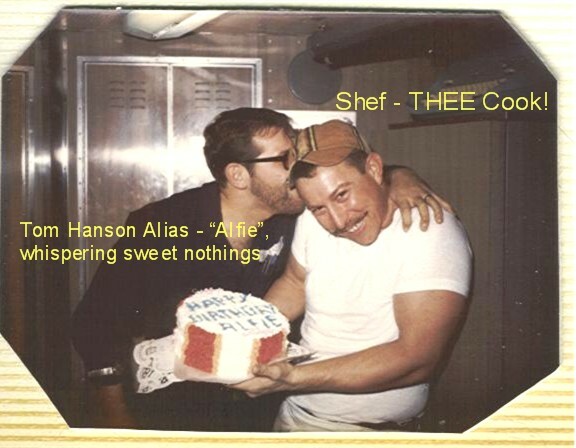 Also from Bill Jones - (This) is a radioman special. 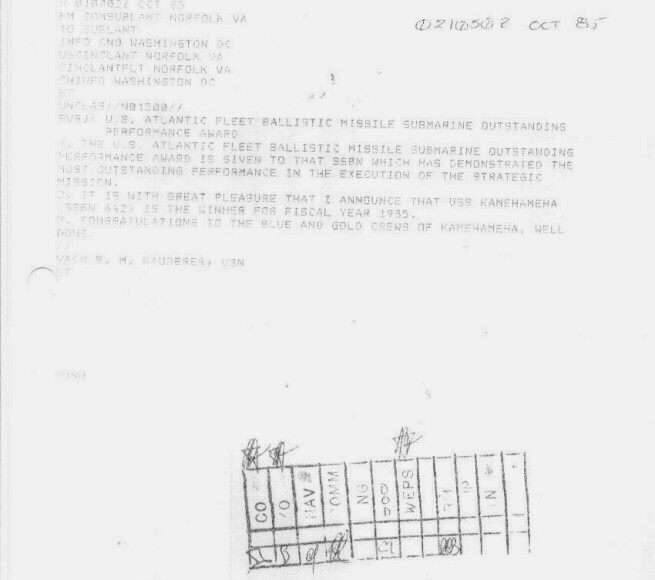 Although it's not a good copy, it's the actual message announcing the Kamehameha as the best in 1985, both crews, from VADM Kauderer, COMSUBLANT. Complete with routing stamp!! 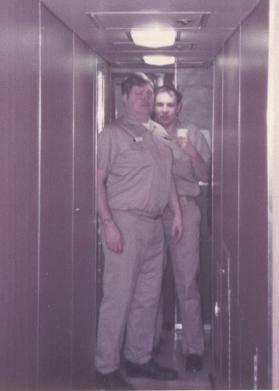 From J. R. Biggs: The second is EM-2 Benny Hill (The BOB of the Boat) and Myself. 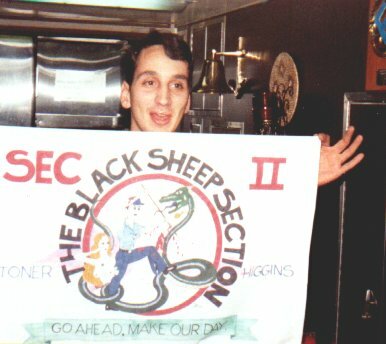 Julian Metzger and the Black sheep duty section flag. 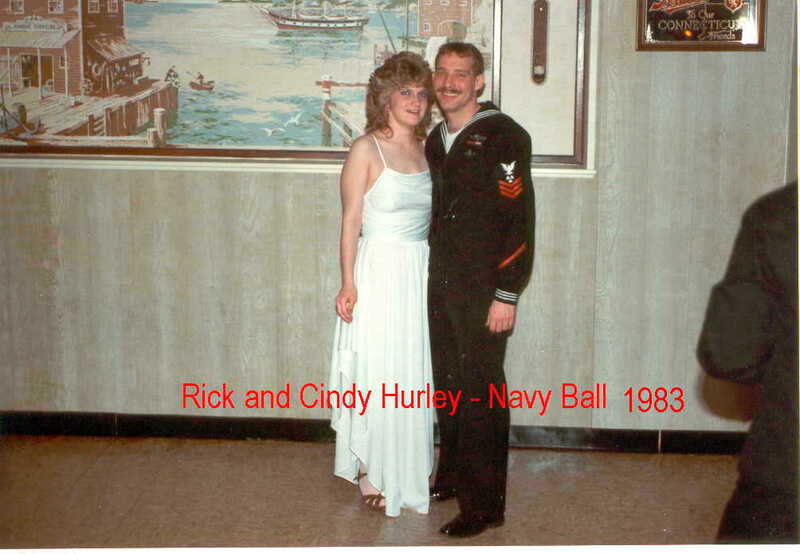 About 1985? Photo from Ken Pugh. Julian Metzger again this time in AMR2? Photo from Ken Pugh. 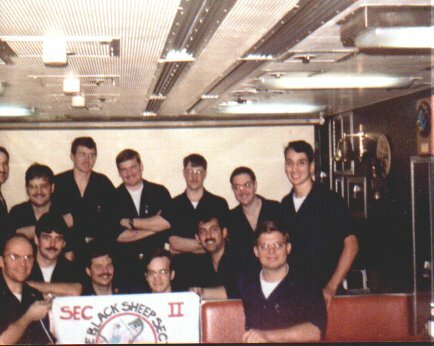 Duty section II (the Black Sheep). Photo from Ken Pugh. 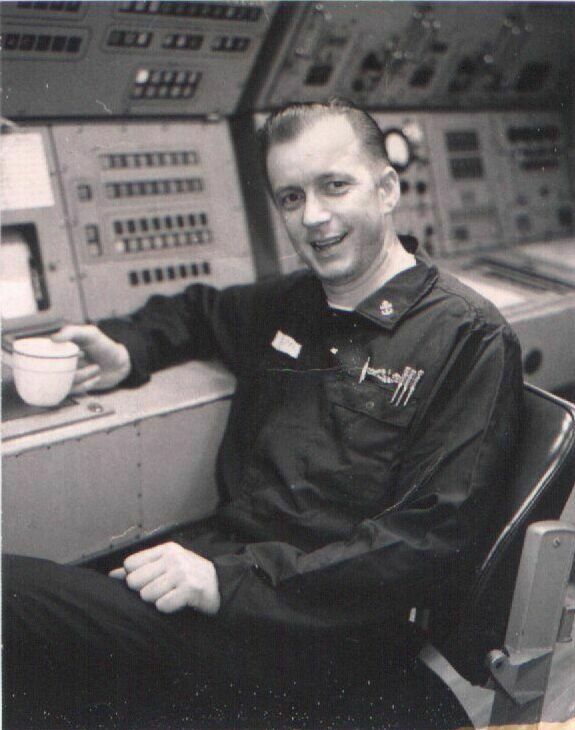 Chief Don Tschopp at the NCC (Navigation Control Console) - 1966. 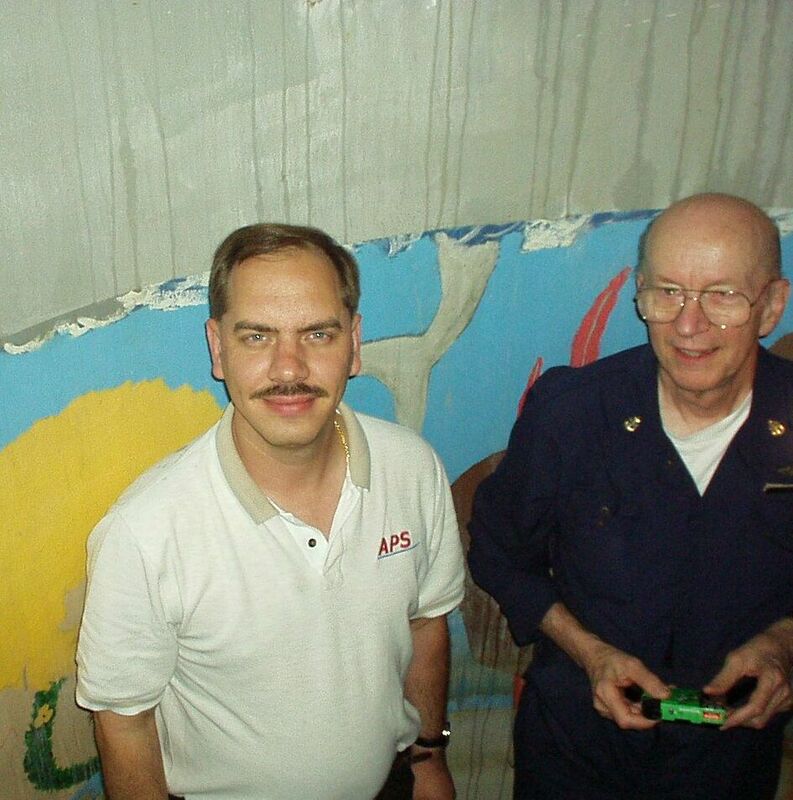 This is me with Don Tschopp inside tube 15 during our cruise in September of 2001. 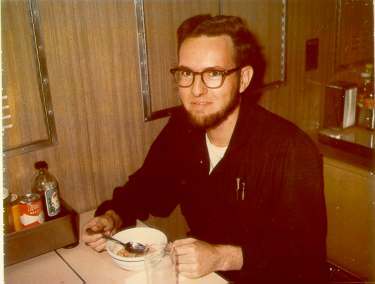 From Roy Prizer: " think it was 1967. 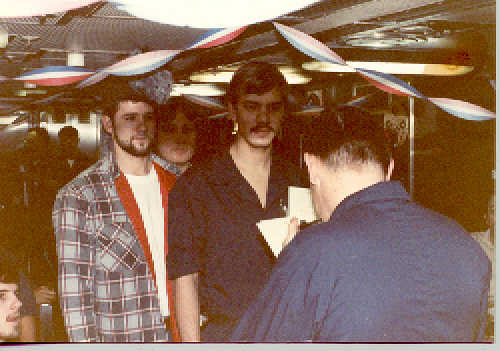 I was receiving a citation for work the Seaman gang had preformed on welds and repainting of the hull. 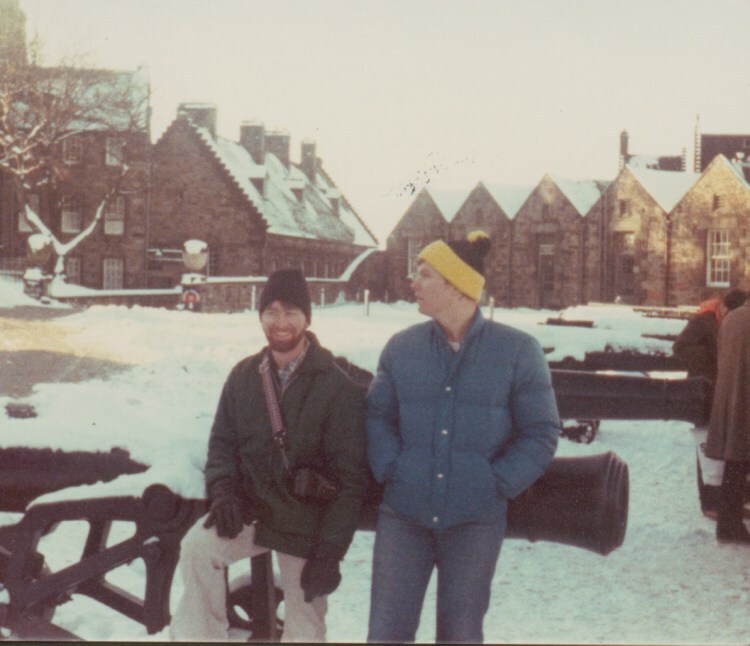 I was in-charge but Tom Shue ran it. He should have got the award. I did not have on my football metal at that time." From Tom Hanson: "1st P.O. 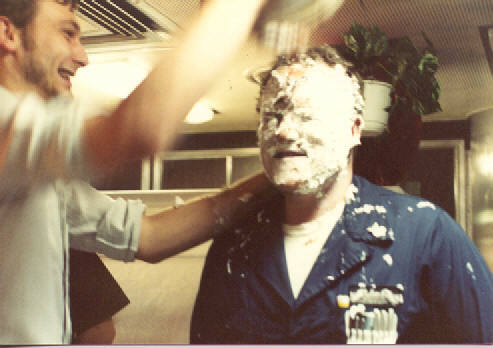 Shef giving me my birthday cake in the aft of the mess hall. 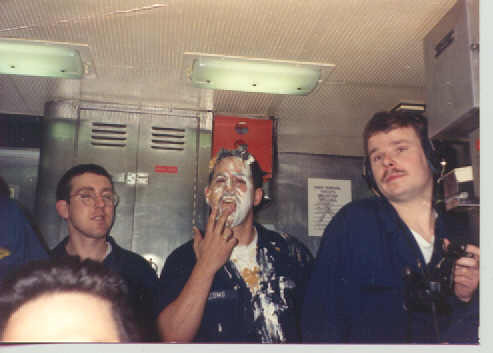 This was Shef's last patrol. 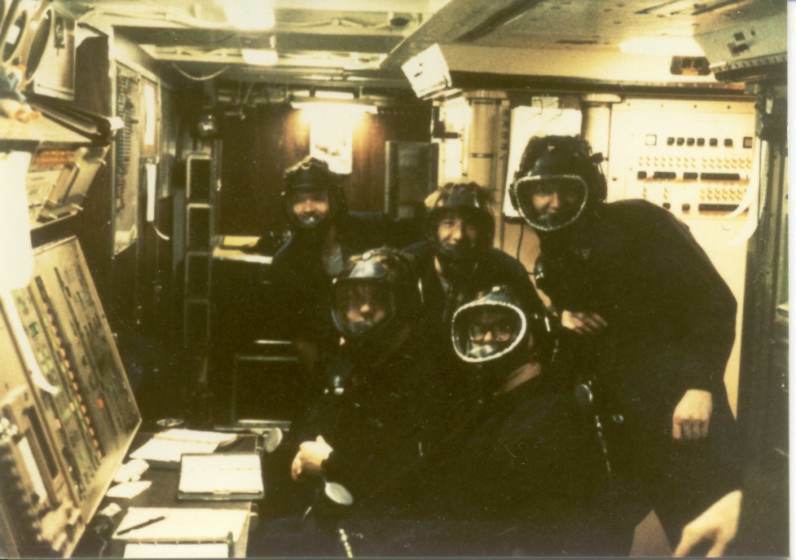 We had left patrol depth and were at 400', if I remember correctly, trying to avoid a typhoon which was churning things up pretty good. 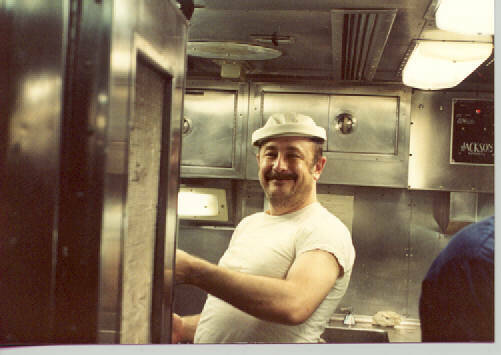 We were still rolling 20-25 degrees at depth, mid-rat beans spilled, Shef slipped on them and spent the rest of the patrol flat on his back in the 1st Class Bunk room. They off loaded him strapped on a stiffback stretcher in Guam." 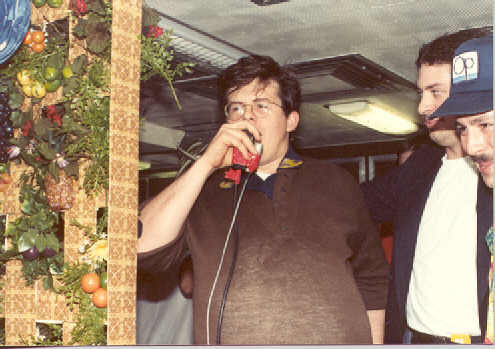 From Dan Burns: M-Div field day (1985) with John Helton and Robert Dean. John Helton, Robert Dean and Dan Burns. Can anyone else identify the others? From Bill Larusch: In March I was up in Malone, NY for the State 10 and under Hockey Tourney. Across from our motel ( there were no hotels in this tiny burg) was and Econo Lodge with a restaurant. 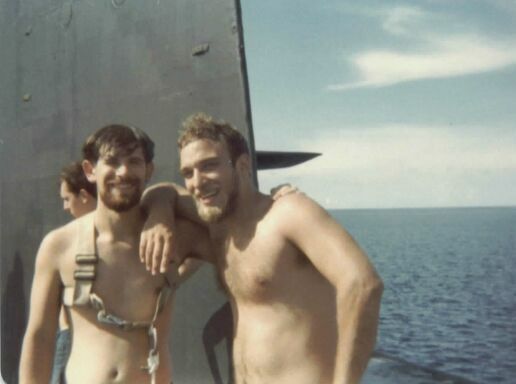 It turns out the the Northern Chapter of the NY Sub-vets meet twice a year there. 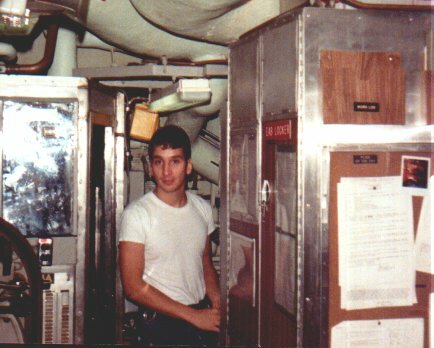 The hallway leading to the rest rooms was covered with pictures and other memorabilia. This is me next to the picture of the Kam after the conversion. What a small world we live in. 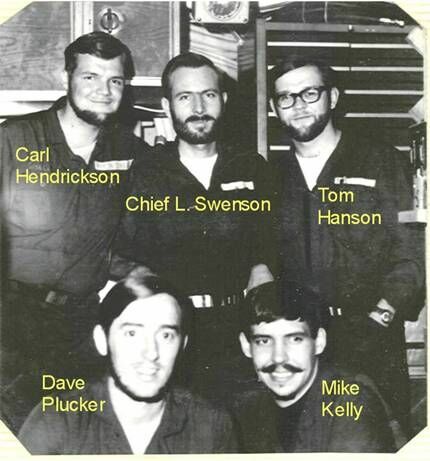 From Tom Hanson: Taken on patrol, Blue Crew ELT�s, Chief Swensen�s and 3rd Class, Dave Plucker�s first patrol, as I remember, fall of 1967. 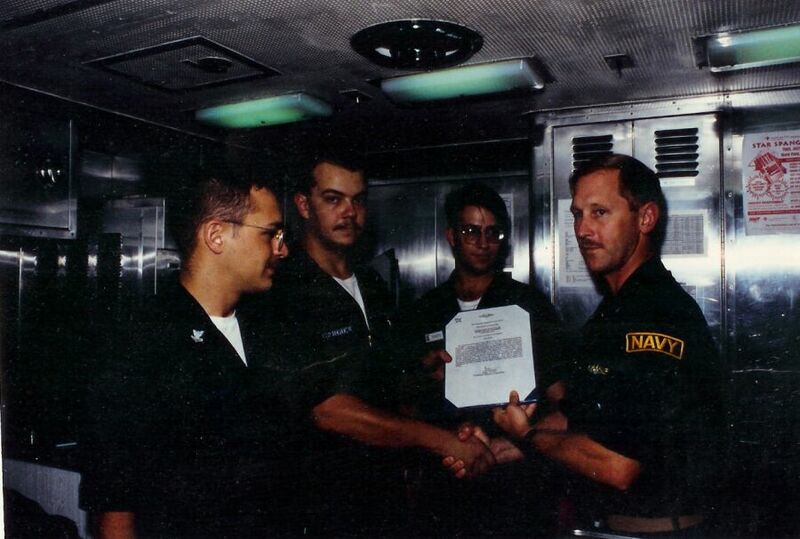 From George McMurren: An award ceremony in Pearl Harbor. 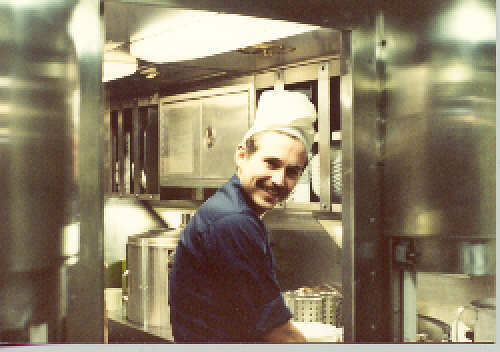 Sometime in the mid 1990s? 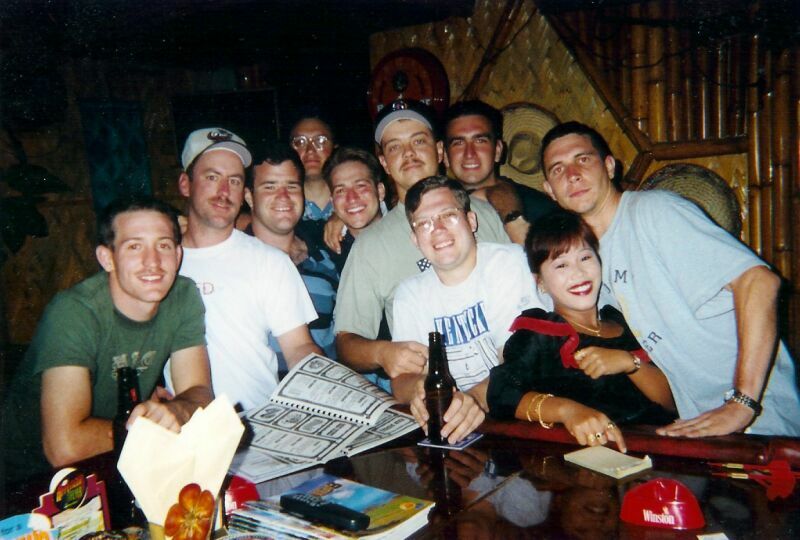 From George McMurren: The bar scene in Saipan - 1990s. 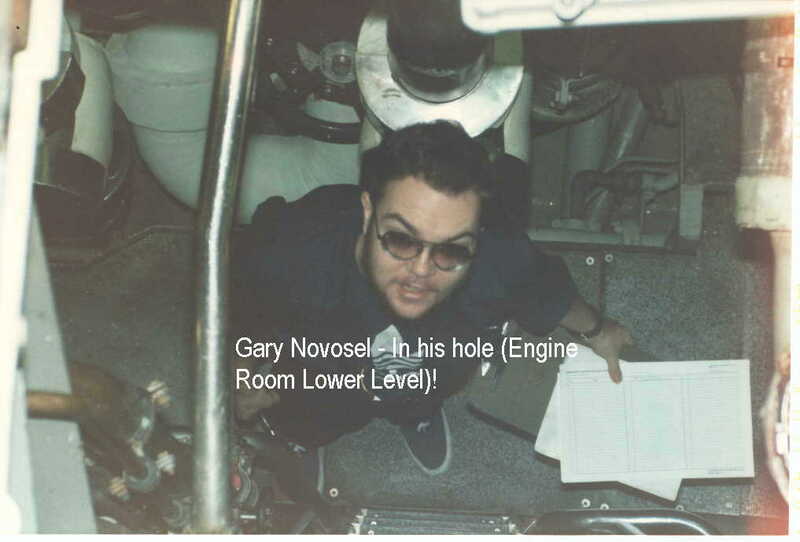 From George McMurren: CDR. H.F. Reese presenting myself Nick Eggar and Trevor Powers awards.